The NCECA Emerging Artist award has greatly impacted my practice and life in the months following the recognition. It gave me the reassurance I needed to continue to push the medium of ceramics. Being able to have a show in conjunction with the award provided the platform to make a new body of work that I could then receive feedback from fellow artists and attendees at the conference. This body of work allowed me to play with scale and content that I might not otherwise have made without the challenge. The award also made possible an international trip to Portugal to continue to gain reference and inspiration for future projects to come. The future can be difficult to imagine, let alone act upon. Yet, envisioning what’s to come is a process with which artists continually struggle and engage. Shortly, following her presentation at the 2017 NCECA conference, Roberts learned that she had been selected to create a new work for the 2017 Parcours Céramique Carougeois (PCC), a biennial exhibition organized by Fondation Bruckner, spread across about 30 different locations in Carouge and Geneva, Switzerland. Roberts next had to train her vision on her new project for this selective and innovative program involving artists from twelve countries—all fifteen years or less from receiving their degrees. The goal set by program organizers was to explore tensions between tradition and innovation. The exhibition ran from September 16–24, but Roberts arrived a month early to build her piece on site in the Halles de la Fonderie, a central location for PCC. Her Gate to nowhere was made of fiber and unfired clay. At the closing ceremony of the symposium, Roberts learned that she had won the Fondation Bruckner Award. Recently, Roberts took time out of her demanding schedule to consider some questions I’ve been formulating about her work since her presentation in Portland. The generosity and thoughtfulness of her responses provide an opportunity to dig deeper into her thoughts about clay’s aptitude to evoke fragility and permanence, the material’s evolving position in her own contemporary art practice, and her interest in the power of the ephemeral. JG: The work you shared in your presentation to the 2017 NCECA Conference had a lot to do with working with clay in unconventional ways to engage with space. Your works interrelate to architectural settings and envelop the viewer’s experience of space. There have been rich diverse traditions of ceramics operating in architecture. How do you see your work as building on and departing from those legacies? KR: I begin my installations in architectural settings in many of the same ways others throughout history have. I question what the function of the space is, how will the qualities of the ceramic material relate to it, and what are possible ways for viewers to interact. However, where I see my work diverging from this tradition is the fact that the installation is never meant to be permanent. It is always just a visitor. The spaces I have been most drawn to lately are ones lingering between life and death. I study these spaces to discover their history and how they became the way they are now. The temporary installation is meant to highlight these discoveries and to empathize with the space. I see clay as the perfect medium for intervention firstly for the fact it is just dirt. This connects often to the foundation of these buildings or the materials that were used to build them. The addition of clay does not feel other in its use or positioning. Secondly, the use of the material in its unfired state emphasizes the state of the building itself. Each piece is there to visit, highlight, offer comfort, and then quietly depart. JG: I wonder if you could share a little about how you see the content of your work beyond the materials and process you use. Some of the works you shared involve wall and gate-like structures. Others are evocative of feminine body and garments. In the current political climate, imagery may be viewed as issue oriented in ways that you might or might not have intended. How do you see your work connected to that of other artists working with similar content within and beyond those working in clay? Who and what are you looking at and gaining inspiration through? KR: One of my favorite contemporary artists is Diana Al Hadid. A professor in graduate school introduced her to me and since then I have been consistently enamored by each body of work she creates. We share an interest in making art that is born out of its materiality and through years of studying her work she has taught me about time and the spirit. Her work is not overt but instead filled with symbols quietly baring light on her connection to two drastically different worlds, Syria and Midwestern America. Though the basis of our work does not interrelate, I strive to create work that lingers in this in-between where the audience is allowed to bring their own. JG: What, if any role does work in media and modalities outside of clay have in your creative process? In what ways do practices like journaling/ writing, drawing, and or digital work feed into your practice? KR: Recently I have been listening to the journals of the critic Susan Sontag. In her earlier journals, she states “I intend to do everything… I shall anticipate pleasure everywhere and find it too, for it is everywhere! I shall involve myself wholly…everything matters!” I try my best to live in such a way as well. This stems from a residency I had in Paris when I first graduated from undergraduate school. I didn’t have access to a ceramics studio, so instead every day I would pick a part of the city and explore. I would go to museums that had no direct relation to my work because I felt like I never knew what would and wouldn’t have an impact. I took tons of pictures. That was six years ago and I still find myself going back to those images and notes I made while there. It was an image that I collected of a blueprint of the gate at the Palais Royal that led to an entire body of work dealing with gates. I wish I drew more. My form of drawing is listing questions, drawing webs, and listing words that relate to themes I am dealing with. Probably my biggest challenge but experience that often comes with the greatest reward is getting out of the studio and traveling. It can be hard to do because of time and finances but when it happens it leaves me salivating for more. JG: You have been balancing your studio practice with extensive commitment to teaching. In what ways does your passion for your work as an educator affect and influence your own studio practice? KR: Balance is something I’m still trying to figure out and I assume will always be this way. Teaching has made me accountable. Accountable for my practice, my work, and for the future of this medium I love. Teaching has challenged my own sense of questioning. I ask students all the time not to assume they know how a material works or what the outcome of an idea is going to be. In telling them, I am constantly reminding myself to do the same thing. The most influential aspect being an educator has had on my practice is being part of a community dedicated to making and learning. At the University of Washington, I am surrounded by artists who work with different mediums such as glass, metal, painting, printmaking and come from different backgrounds. It challenges my assumptions and expands my ever-growing toolbox. JG: What was the most valuable advice you received through your experiences in art education, whether as a student or a teacher? KR: I mentioned during my artist lecture how John Gill once told me “Just date it, you don’t have to marry it.” My interpretation of this was just do it. I believe this fully and I don’t think I would be where I am today if I didn’t just do it. I can think of many times throughout my short career that I didn’t wait for someone else to do it for me. For instance, in-between degrees I didn’t have opportunities to show work so I contacted local galleries about curating my own show. The show gave me a deadline and goal in my studio, allowed me to interact with artists working in mediums that weren’t my own, and enabled me to produce the work I would then apply to graduate school with. Sometimes you just need to take it upon yourself to get you where you need to be. This isn’t always easy and often ends with disappointment; though it sounds corny, at least I know I tried. JG: What would you like to share with students today that may not have been shared with you when you were a student? KR: Making art is a struggle. There will be highs and lows and most of the time you will fall somewhere in-between. When I was going through school, discussions never were quite this candid. I watched professors have show after show, and from my perspective they were constantly working in their studios. I never questioned if they had self-doubt about their practice or work. Since leaving the comfort of school, the struggle expands. Obstacles and concerns such as life, jobs, the comparison of ourselves to others, the need to push yourself harder in the studio, to dig deeper, and to make better work becomes even more real. Just the other night I attended an event for an arts organization. In a grant recipient’s acceptance speech, I found his proclamation that making art is a struggle comforting. It’s okay to feel this way. Without this struggle, [there] will be no high. Let it feed you and create a drive to overcome those obstacles. Keep placing one foot in front of the other. And when something great happens to you, soak it in so that it nurses those moments when you feel low. JG: Many artists are navigating new challenges in building their careers in an evolving marketplace where traditional galleries and gallery representation appears to be waning. How have you affected by these kinds of challenges and what strategies have you been pursuing to make your practice more visible to collectors and the public? –How can work that is ephemeral be collected? A photograph is often the only way someone will ever see your work. In this case, when I take photos of my work I think of them as a piece of art themselves. I have always tried to make sure that the photograph will give you as much information about the piece as possible in order to allow the viewer to feel what someone in the space might have experienced. Artists in the past have used this as a form of collectability, issuing editions of prints. -Will galleries exhibit work that might not be sellable? The nature of my work has closed many doors for some commercial galleries. My strategy for showing is constantly changing and evolving. I first started by looking for exhibition opportunities that provided stipends for shipping and installation. The way I make is often considerate of what my budget is, so I have been forced to be creative in how I ship work. I wasn’t always so considerate of this, and shipping was an afterthought. I now try to make that part of the conception of the piece. 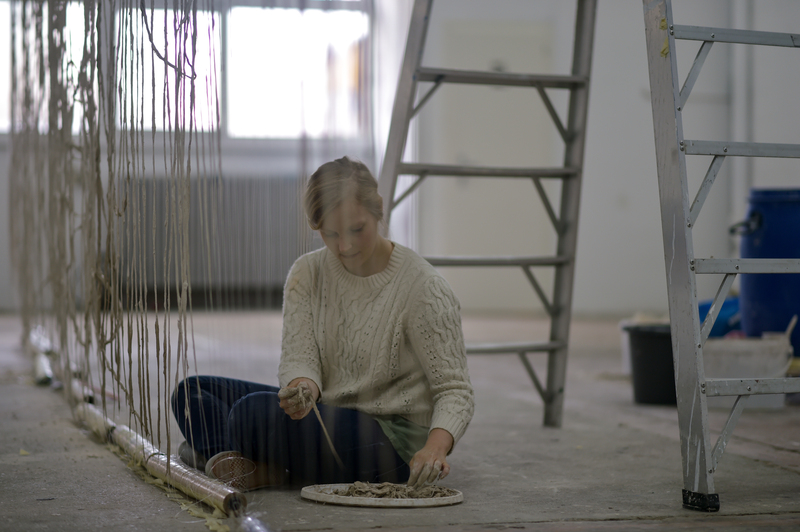 Recently, I have been looking into opportunities where a residency is involved and I can make work on site. -Will galleries show work that is unfired? This has not been as much of a challenge as I thought it would be. If a gallery is open to showing work that isn’t to be sold, they usually are okay to showing ephemeral work. I do have to be aware of the material of clay and how it contains silica. The installation needs to be so that it is not harmful to those that view it. JG: What is happening in your studio right now that you are feeling most excited about? A couple major events happened in recent months that have enlivened my studio practice. Firstly, I installed a piece in Carouge, Switzerland as part the 15th Parcours Ceramique Carougeois. I spent a month building the work in an old foundry building. The piece was up for a week and at the closing the organizers of the event conducted a performance of it being cut down. I have never filmed the removal of one of these installations. This has created many possibilities the removal of work could play or become part of the installation itself. Secondly, I received a Grant for Artist Projects from Artist Trust, an organization based in Washington state, to buy my own portable theatre lighting. This will allow me to install pieces in spaces that may not be set up for installations or art at all. I can play with light in ways I have never been able to. And lastly, I am continuing to research and make with clay dust. As I worked on the piece in Switzerland, I listened to a book about the Dust Bowl of the 1930’s in the Midwest and was in awe of how the dust lingered in the air. I think this visual will find its way into a new body of work. Kate Roberts’ reflections on her work offer all of us an opportunity to be mindful of our own efforts to balance the durable with the ephemeral in our lives and work. At the heart of ceramic art and education, we share our love of making. Teaching and learning through tactile experience with materials and objects link us to one another and to history. As we enter the season of thankfulness, NCECA wishes you and yours peace, safety, and the freedom to create and connect through clay in your lives, studios, and classrooms. The National Council on Education for the Ceramic Art is immensely grateful to the Windgate Charitable Foundation for their support of NCECA’s Emerging Artists program from 2013-2017. Additional blog entries will appear on other 2017 recipients of the award before our 2018 cohort will be announced in the month leading up to the conference in Pittsburgh.